LIVINGSTONE, Zambia, May 26, 2014 (ENS) – The park ranger in charge of law enforcement at Liuwa Plain National Park in Zambia was shot to death by suspected poachers Friday while investigating reports of gunshots in the park. 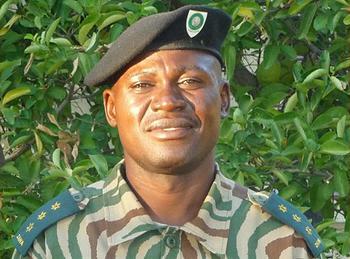 Dexter Chilunda was on secondment from the Zambian Wildlife Authority to African Parks Zambia. Chilunda was shot in the chest by a suspected poacher while searching for the source of gunshots that had been heard by park rangers stationed at an outpost in the park. Zambian officials believe that Chilunda encountered two poachers in the central area of the park, one of whom shot him at close range with a shotgun. Police and park rangers investigating the incident have followed tracks leading from the scene and are following up concrete leads. A reward of 60,000 Kwacha (US$10,000) has been offered for information leading to the arrest and conviction of those responsible for Chilunda’s death. The park management team was informed of the shooting at 9:00am on Friday and rushed to the scene while putting plans in place for emergency medical evacuation. Police were informed of the shooting and three police officers were immediately dispatched to investigate. Every effort was made to assist the critically injured officer, but he was pronounced dead on arrival at the park’s Matamanene Camp, from where he was to have been airlifted to the nearest city, Livingstone. Park management had arranged for a medivac jet to airlift Chilunda from Livingstone to a hospital in Johannesburg for emergency treatment. Chilunda’s wife and children will be financially provided for under the life insurance policy put in place by African Parks. 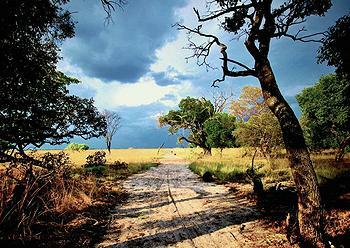 Liuwa Plain National Park lies in Western Province, Zambia, west of the Barotse Floodplain of the Zambezi River near the border with Angola. Situated in the seasonally flooded Western Zambezian grasslands ecoregion, in one of most out-of-the way and least-populated areas of the country, the park has no road access and no facilities. The nearest settlement is the small town of Kalabo, about 40 km to the south. Since 2003, the park has been governed by African Parks Zambia, a partnership between African Parks, the Zambia Wildlife Authority and the Barotse Royal Establishment, the traditional government of the Lozi people. African Parks’ active approach to reestablishing native wildlife populations and relocating extinct species has resulted in the increase of wildebeest, Connochaetus taurinus, numbers from 15,000 animals in 2003 to 43,000 in 2011. Liuwa now hosts the second largest wildebeest migration in Africa, offering spectacular sights of thousands of animals. After nine years alone, Lady Liuwa formed a pride with two female and two male lions, introduced from other African locations. One of the males was killed by a poacher in 2012, but this January mating with the young lioness was successful in producing three cubs. The three adults in the pride – the mother, the male lion, and Lady Liuwa – “appear to all be playing a role in protecting the cubs,” says African Parks. 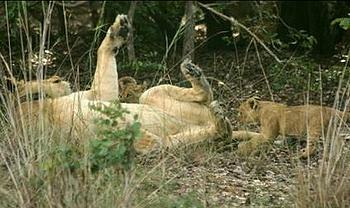 The Liuwa management team continues to monitor the lion pride and its cubs to minimize dangers. Other predators include spotted hyenas and African wild dogs. Wild dogs are top predators, and their return to Liuwa signals a recovering ecosystem. Also recently reappearing in the park are roan antelope and eland, Tragelaphus oryx, valued as a cultural symbol by the Lozi people. A small herd of buffalo were reintroduced and is growing and zebra populations are increasing. More than 330 bird species have been recorded in Liuwa, including globally important populations of storks, cranes and other water birds. Classed as Vulnerable, the crowned crane, Balearica regulorum, and the wattled crane, Grus carunculatus, are abundant, forming flocks of several hundred birds. African Parks is a non-profit organization that takes on total responsibility for the rehabilitation and long-term management of national parks in partnership with governments and local communities. African Parks operates seven national parks in six countries: Zambia, Malawi, the Democratic Republic of Congo, the Republic of Congo, Rwanda and Chad.